The liquid scintillation counting procedure for tritium quantification in environmental samples was optimized with respect to sample to cocktail volume ratio, fixing of region of interest of tritium spectra, and choice of counting vials for measurement of low-level activities of tritium in water samples. The optimum sample to cocktail ratio for Aqua-light scintillation cocktail based on the MDA values was found to be 8: 12 mL. The optimum window for tritium at optimum sample to cocktail ratio was found to be 2–12 keV based on figure of merit values, and the reduction in the background count rate was 31% compared to full window. The efficiency of the system at optimum sample to cocktail ratio was studied using two different quenching agents, carbon tetrachloride (CCl4) and nitromethane at different quench levels. It was found that quench effects were stronger for the standards with nitromethane compared to CCl4 at any specific volume. 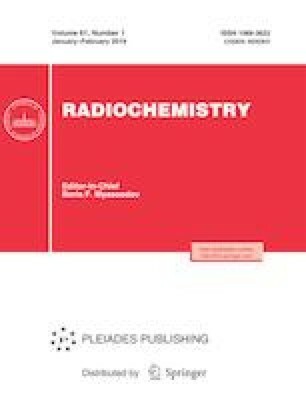 The tritium recovery factor for distillation technique, which is used for removing quenching agents present in water samples, was found to be 95% with the relative standard deviation of 0.34%. The conditions established in this paper are useful for measurement of low-level activities of tritium in the environmental samples.